Based on the true story of the first serial killings in Korean. The body of a young woman is found brutally raped and murdered, and similar crimes continue to occur. 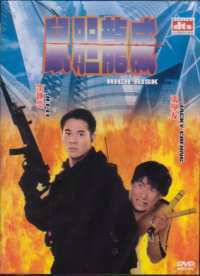 A special task force, joined by a detective from Seoul and a local officer is set up to investigate the crimes. In spite of their differing investigating styles, the detectives find out that women wearing red on a rainy day are the killers targets. They try to set up a trap to catch the killer, but another body is found the next day. As the number of victims increases the detectives become more and more desperate to catch the elusive killer. On the Bullets N Babes DVDs forum that I use, Memories Of Murder has been stated as some of the users' favourite Korean film to date, while most others heaped praise on all aspects of the film, glorifying it as a magnificent testament to the quality of Korean cinema. So when I finally got round to watching the DVD (after only a couple of years on my shelf) I had just a little excitement and expectation on what I was about to watch. Being a murder thriller based on true events in South Korea's recent history, Memories Of Murder has the added chill bonus that goes with knowing that the horrors on screen actually took place. The story is firmly grounded in reality and not purely some work of fiction. This is a gift to the film-makers as the viewer is giving the film that extra level for it to affect them on and I think it is something that should be used to the film's advantage. Unfortunately it is not. To be honest, I wasn't overly impressed by with Memories Of Murder and if anything I found myself getting quite bored at times. The pace is very slow, with things only really heating up towards the end. A slow pace can be good as it can draw the viewer in a lot more, but to make it work the film has to be gripping, but this one isn't. We see the detectives interrogating suspects and while you do believe that they genuinely want to catch the killer, when you see them beating the suspects and trying to get them to confess to the crime even though they know the suspect is innocent, the viewer can lose the sympathy required to get them on the detectives' side and involved with the story. This is further made worse by seeing the same routing happen over and over again. It seems that their investigating format is: bring someone in, beat him, try to get him to confess, repeat. While the repetition is not a good quality, there are areas where the film shines. The main one being character development, none more so than with Kim Sang-Kyung's character. He's a cop from Seoul who's come to the small town to help with the murder investigation. He believes in doing things more by the book and that documents never lie. Over time as the killer continues to elude them and as he becomes more attached to the case his thoughts and beliefs start to change. We see the desperation slowly creeping in and the desire to charge someone with the murders increase. Fixated on the guilt of one particular individual, even when documented evidence indicates that his suspect may in fact be innocent, he wants to ignore it, believing it to be wrong and his own intuition right. This is a character drama showing the effects the murders have on those involved. But linking to what I've already stated, for a character drama type film to work it must have characters that the viewer cares for and likes, but I didn't care for or like any of them. Maybe the cop from Seoul a bit, but that's it. The cops may be trying to catch a killer, but with the behaviour that you see from them, they should be in prison themselves. What the film does highlight quite effectively is the inexperience and lack of resources the more rural parts of South Korea had to investigate crimes of this nature. This is most evident with one of the early murders, as once the body is discovered police officers and reporters are everywhere in the crime scene. The scene is not contained and the possibility of contamination or disturbance to any evidence is extremely high, demonstrated by them losing an imprint of a footprint in the mud as a tractor drove over it. You maybe can't blame them in their lack of experience as it is a small town and serial killings aren't what you expect in that sort of area. 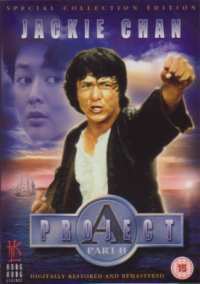 Also, based on writing on the front of the DVD cover, these were the first serial killings in Korea. Thinking about this and being sympathetic to the characters in this regard does not help make the film any better though. While telling a good story, the film never excels, staying at a slow pace of averageness. To say I was disappointed is a bit of an understatement. So many people had sung Memories Of Murder's praises, but I honestly can't see what all the fuss was about. Memories Of Murder comes with both DD and DTS soundtrack options and I watched in DTS mode. The surrounds are not given a heavy work out, but what their use lacks in quantity it makes up for with quality. The most frequent use of the surrounds is for rain. The sound of pouring rain spreads right around the sound stage very effectively. Discrete sounds come from all around when necessary. On the whole there is nothing to complain about. The subtitles are of an excellent standard too. I didn't notice any spelling or grammar errors, and Korean text on screen is subtitled on virtually every occasion. The only instance when it was not was when someone was speaking at the same time, so the subtitles were for the speech. Edko seem to be a very good company for giving good quality film transfers. There is nothing that negative to say about the picture. At times maybe there was a little bit of a grainy shimmer, but that's it. Colours were great, clarity was as good and there were very little in the way of speckles in the film's duration. There is a small set of extras here, most of which are pretty standard. There's the theatrical trailer, a set of TV spots which are just 10 second mini-trailers for the film, a photo gallery, cast and crew filmographies and lastly a Behind The Scene feature. This feature just shows them filming a few different scenes from the film. There are no interviews with the cast or anything like that in it, and there are no subtitles. So nothing special in the extras I'm afraid. 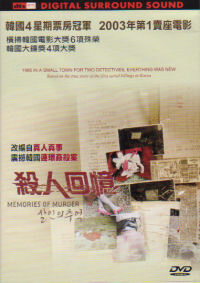 Memories Of Murder is not the film I was hoping for or expecting. It is slow and not overly gripping. There is very little empathy and sympathy elicited from the viewer towards the characters and these are things that a film like this really needs. There are good character interactions and development, but not enough to make it the great film I'd been lead to believe it was.